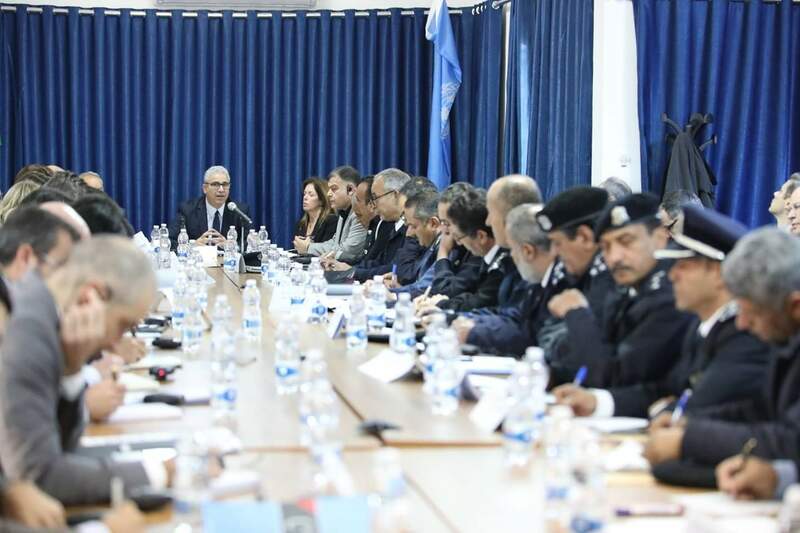 UNSMIL hosts a meeting between the international community and the Faiez Serraj Ministry of Interior to mobilize support in improving Libya’s security sector (Photo: UNSMIL). UNSMIL hosted a meeting yesterday at its Tripoli headquarters between the Presidency Council and Government of National Accord’s Minister of Interior (MoI), Fathi Bashagha, and his Ministry’s top ranking echelon, and representatives of the diplomatic corps in Libya. UNSMIL reported that the meeting was part of its continuous efforts to support the Faiez Serraj Libyan Government in strengthening the capacity of State’s regular security institutions. The meeting’s main objective was to mobilise support for the Ministry of Interior and its respective security directorates. Ambassadors and representatives of 17 states – a number of them attended from UNSMIL office in Tunisia via video teleconference – along with the European Union Ambassador to Libya, participated in the meeting. During the meeting the Interior Minister Bashagha delivered a briefing about his strategic vision as well as the specific requirements and needs to build the capacity of seven key police departments and implement this plan. Addressing the meeting, SRSG Ghassan Salamé welcomed and thanked all attendees and added that “This meeting is necessary, because there is a firm decision by the Government of National Accord and Minister Bashagha to exercise all responsibilities entrusted to the ministry and contribute to extending the State’s authority over all its territory. This meeting is a clear message of the international community’s strong support for this decision”. Deputy SRSG Stephanie Williams expressed her optimism about the recent steps taken by the Ministry of the Interior. “This meeting illustrates UNSMIL’s recognition of the criticality to support and reform Libya’s security sector. Your support in these efforts is essential. Already some of you have come forward and we are grateful for your trust,” said Williams. Representatives of the international community extended full support to the Interior Minister and expressed their commitment to provide technical, political and strategic assistance to the ministry’s efforts and plans to strengthen the capacity of the security authorities. The participants agreed, at the end of the meeting, that UNSMIL organises another meeting after two months to evaluate the results of the briefing and the assistance provided.